Today got off to a bright and early start. As soon as daylight permitted, we had spotters out on duty looking for more marine mammals. We began to survey at the north end of Heceta bank, where we again encountered many humpback whales lunge feeding. We broke transect, and got some great video footage of a pair them – so check our youtube channel next week – we’ll upload the video as soon as we get back to better internet (dial up takes some getting used to again – the whales don’t know about highspeed yet). 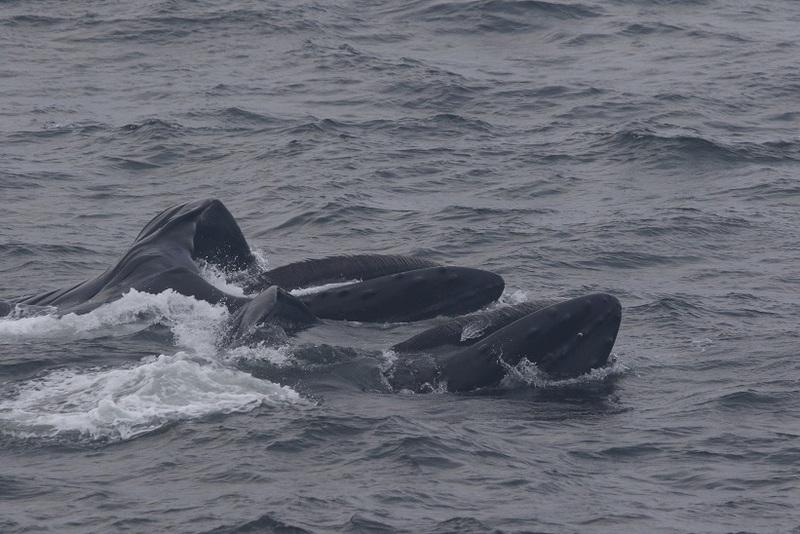 Humpbacks lunge feeding at surface. photo credit: Leigh Torres. Taken under NMFS permit 16111 John Calambokidis. After working with the humpbacks to capture photo-id data for about an hour, we turned south, and ran parallel to Heceta bank until we reached the southern edge. Along the way, we counted 30 humpbacks, and many California gulls, marbled murrelets, pink footed shearwaters, and sooty shearwaters. After lunch, we conducted a CTD cast to see how conditions might be different between the southern and northern edges of the bank. 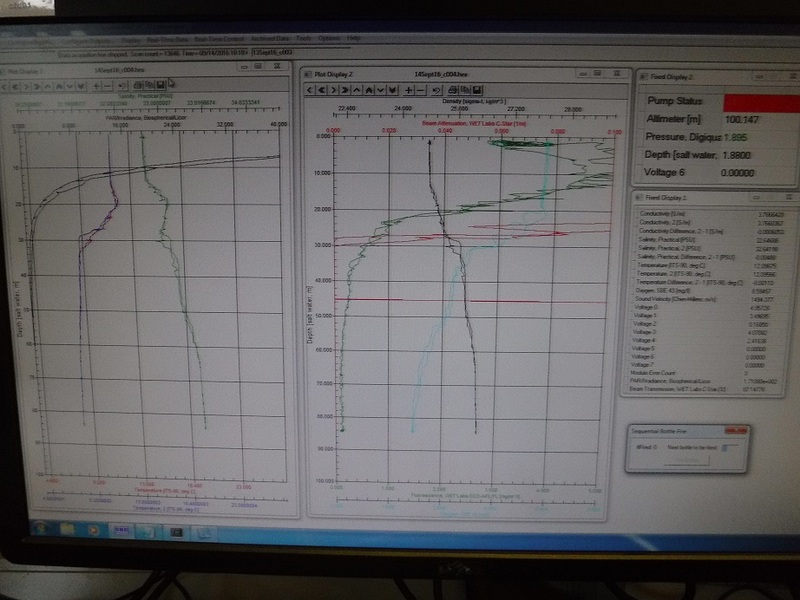 Surface temperatures increased from 12.09C to 13.2C while bottom temperatures decreased from 8.7C to 7.8C. The northern station was a textbook perfect two layer system. It had a well mixed surface layer with a steep pycnocline separating it from the colder, saltier, denser, bottom layer. The southern station still had two layers, but the pycnocline (the depth where a rapid change in density occurs, which delineates the edges of water masses) was not as steep. We are interested in these discreet measurements of ocean conditions because areas of high primary productivity (the green chlorophyll-a line) are often re-occurring hot spots of food for many levels of the food chain. Since we can’t phone the whales and ask them where to meet up, we use clues like these to anticipate the best place to start looking. Readout of the CTD cast. The left plot has temperature in blue, and salinity in green. The right plot has density in black, chlorophyll-a in green, and oxygen in blue. observe how different variables change with depth (on the y-axes)! We next turned west to transect the continental shelf break. Here, we were hoping to observe changes in species composition as waters got deeper, and habitat changed. The shelf break is often known as an area of upwelling and increased primary productivity, which can lead to concentrations of marine predators taking advantage of aggregations of prey. 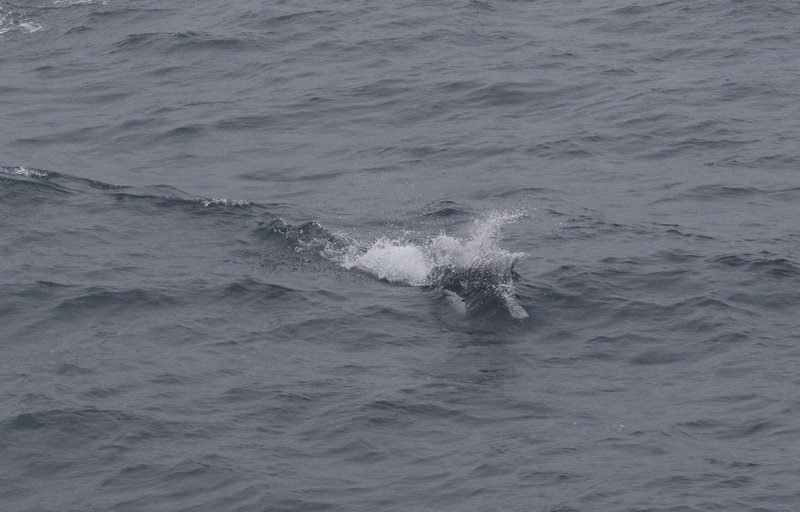 As we moved further offshore, everyone was hoping for some sperm whales, or maybe some oceanic dolphin species, and if we’re really lucky, maybe a beaked whale or two. Today our students learned the lesson of how difficult marine mammal observation can be when our target species spend the majority of their lives underwater – where we can’t see them. While there were a couple of hours of mammal empty water in there, observers were kept busy identifying long tailed- jaegers, cassin’s auklets, murrelets, petrels, shearwaters, fulmars, and so many black-footed albatrosses, that they almost became “normal”. That being said, we did spot a fin whale, a few groups of Dall’s porpoise, and three pacific-white-sided dolphins. Unexpectedly, we also saw an unidentified shark, and several sunfish (mola mola)! Humpback whale profile – notice the hump before the dorsal fin. photo credit: Amanda Holdman. Taken under NMFS permit 16111 John Calambokidis. 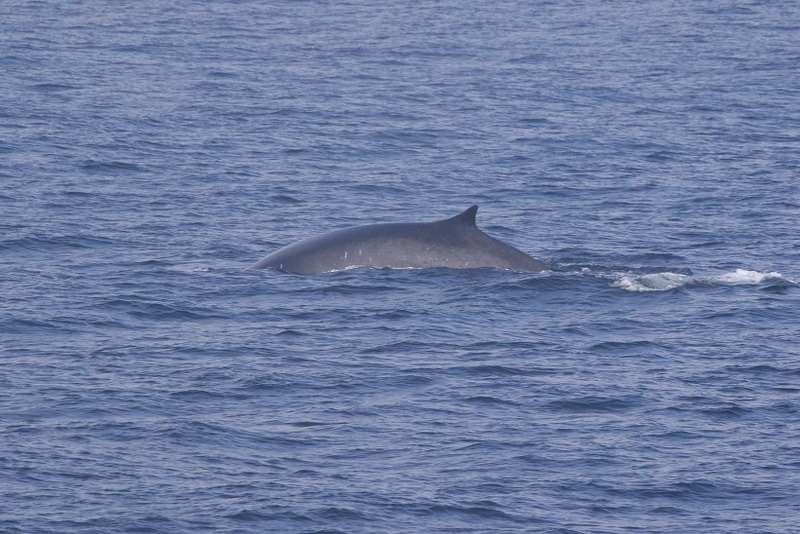 Fin Whale profile – notice how long the back is before the fin, and how pointed the dorsal fin is compared to the humpback. photo credit: Amanda Holdman. Taken under NMFS permit 16111 John Calambokidis. 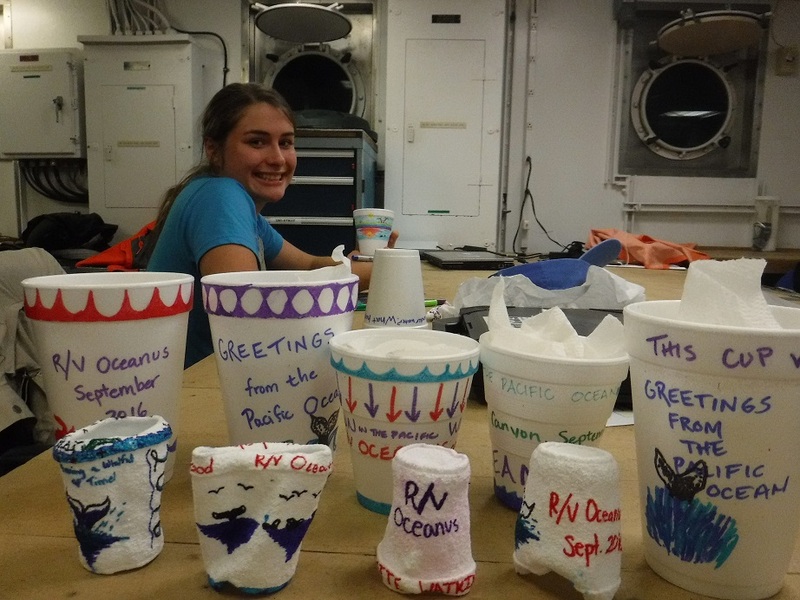 Last but not least, we engaged in a long standing oceanographic tradition, which is to draw on Styrofoam cups, and send them down to Davy Jone’s Locker attached to the CTD. When you bring them back up, the pressure has caused them to shrink to a fraction of their original size, which is an excellent demonstration of the crushing power of pressure (and why its harder to build a submarine than a rocket). Shrunken cups! The first row have been sent down to 1400m, while the back row are still full size! 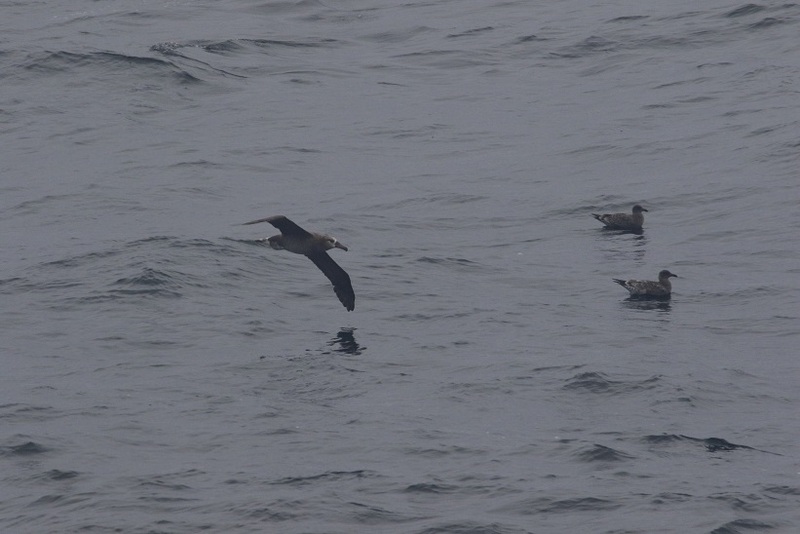 Now, we are steaming north toward Astoria Canyon, where we hope to make some more sightings in the morning. Stand by for news from our final day at sea. Fin Whale. photo credit Amanda Holdman. Taken under NMFS permit 16111 John Calambokidis. Dahl’s Porpoise. photo credit: Florence Sullivan. Taken under NMFS permit 16111 John Calambokidis. Those whales are beautiful…Did you take those photos? Great post btw! Thank you. Yes, all wildlife photos are taken by lab members.